Ingenious idea for all the ‘Gen Y’ nephews and nieces’ gifts this christmas – I’ve got them all customized Havianas, getting them to text me in their colour preferences. I even got my son a pair with the “glow in the dark’ strap option and the little skull and crossbones strap badge. Havianas are now the blanket universally acceptable summer footwear. So cool you can wear them to a meeting which someone did when they came to see me this week. Fashionable enough to warrant a premium, they go by their brand name to diffentiate them from jandals, thongs or god-forbid “flip flops”. I was interested to note that Havianas had a downturn about ten years ago in their homecountry Brazil and they cleverly decided to invest in an international marketing strategy which saw Jean Paul Gaultier feature them on a catwalk. They are hugely into customisation (big marketing trend) not just with over 100 different styles a season but with the little personalisation booth they had last week in the city, where truck loads of uni students (and me) lined up to get ready for summer. 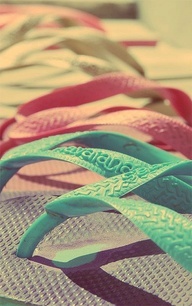 Havianas have to be on my Dress Up list of 50. And its all very appropriate given that this year Haviana is celebrating their 50th anniversary. Slip them on, download some retro beats Sergio Mendes/Astrid Gilberto and yes, you too can become the girl from Ipanema.